Where are Camps Baco and Che-Na-Wah located? Camps Baco and Che-Na-Wah are located in the Adirondack Mountains in upstate New York, about four hours north of New York City. Camp days are typically warm and sunny, with temperatures around 80+ degrees, perfect for swimming in Lake Balfour. Evenings and early mornings are cooler and may require a sweatshirt. 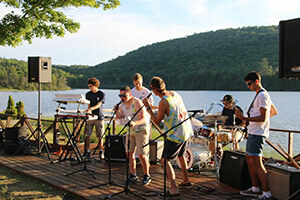 Camps Baco and Che-Na-Wah is a one-full seven week camp. Everyone starts and finishes camp at the same time. We allow campers who are trying camp for the first time to come for four weeks, minimum, with an option to stay for the whole summer. 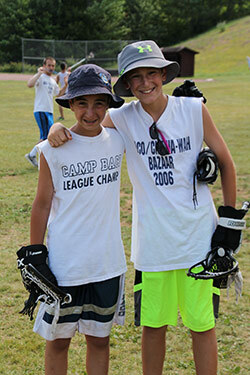 The majority of our campers come from the Northeastern United States, Montreal and Southern Florida. We also have had campers come from all over the world including Spain, and Venezuela! How many campers attend Camp Baco? Approximately 200 boys attend Baco each summer; our youngest are entering 2nd or 3rd grade, our oldest boys’ bunk – the waiters – are entering 11th grade. How many campers attend Camp Che-Na-Wah? Approximately 150 girls attend Che-Na-Wah each summer; our youngest are entering 2nd or 3rd grade, our oldest girls’ bunk – the waitresses – are entering 11th grade. How are counselors trained and qualified? Our staff consists of university and graduate students and certified teachers, many of whom are returning as our counselors . All waterfront counselors have their Red Cross Lifeguard Training Certifications, and swim instructors have Water Safety Instructor certification; our tennis programs are run by tennis professionals and our ropes course and climbing tower counselors are certified. There are at least three counselors in each bunk. Thorough screening and reference checks are conducted for each staff member. Are the camp directors actively involved in camp? Campers’ needs are our priority and we are actively involved with camp every day. We oversee the daily schedule, and get to know each and every camper to make every single child a part of our camp family. How do campers travel to camp? Campers travel to camp on luxury coach buses that are chaperoned by senior staff members. Boys and girls travel separately. Buses leave from the New York metropolitan area and from Montreal, Canada. Campers traveling from other locations typically fly to nearby Albany Airport. We pick up the campers and drive them to camp, which is about 90 minutes away. 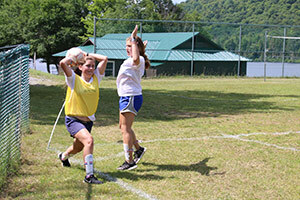 Camp fees include transportation by buses and airport pickup; airfare is not included in camp fees. Included in the Camps Baco & CNW fees includes all camp activities and bus transportation to and from camp. There are additional fees for optional activities:Senior Trip, USTA tournaments, USTA Membership and golf. There is also an additional fee for shipping camp trunks; we provide our families access to a trunk shipping service, pick up is about a week before the start of camp. Do you require campers to wear uniforms? We are not a uniform camp. However campers will need camp T-shirts to wear on special occasions. Che-Na-Wah campers will also need navy blue shorts. We serve delicious and well-balanced meals and snacks, including lots of fresh fruit and vegetables, and we make sure that there are plenty of choices that kids like. We accommodate children with special diets – peanut-sensitive, gluten-free, and lactose intolerant, for example. Our food staff and counselors are adept at accommodating dietary needs. If a child has a peanut allergy, the campers in his or her bunk are alerted ahead of time and asked not to bring food with peanuts into the bunk. Whom do I call when I have a question during the summer? If you have a question, please don’t hesitate to call us at any time. Our office staffs will direct your call or will get you the information you need as soon as possible. Our numbers are (518) 251-2919 (Baco). For Che-Na-Wah (518) 251-3129. During the winter, you can always call us at (516) 867-3895. You can email us: bob@campbaco.com; barb@campchenawah.com. Each camp has its own dining hall. Campers sit with their bunks, and meals are served buffet-style. We also take advantage of our beautiful setting and serve many meals outside, with regular barbecues and cookouts. Is there a way for brothers and sisters to see each other to just “hang out” during the summer? Brothers and sisters get together for a visit ever Saturday after lunch at one of the camps. The location rotates on a weekly basis and we’ve seen siblings grow close. When do the boys and girls get together? How can we keep in touch with our child during the summer? We encourage you to email your camper, and to write lots of letters. You can also arrange to speak to each child you have at camp weekly. Daily, you can see camp in action when you log into our private summer photo gallery.